If you are dreaming of beautiful white sandy beaches, deserted palm tree encircled coves, crystal clear seas and complete rest and relaxation, it's a tropical holiday you are looking for. Why not take a look at some of these beautiful destinations if you are in need of a little inspiration. Set in the Indian Ocean, the beautiful island of Mauritius is the perfect destination for those who want it all from their holiday. With simply amazing beaches, surrounded by crystal clear sea and some of the world's best hotels, offering first class amenities and personal service, it’s an out of this world holiday spot for those looking for a little tropical luxury. Choose from resorts featuring their own golf clubs, waterfront villas, personal butler service in some rooms, shopping facilities, stunning infinity pools, spas and world class restaurants! The great thing about Mauritius is you really can have it all. If you want to lay on a beautiful beach all day, completely uninterrupted and soaking up the sun, you can. If you prefer things a little faster paced, you have access to some of the best watersports facilities in the world, and if you fancy packing some nice maxi dresses and getting dressed up for dinner, you'll find the perfect a la carte restaurant for it. Get a taste of the real Caribbean on these beautiful islands. Here you'll find stunning beaches, clear seas, friendly locals and an interesting and varied history, all set to a jazz soundtrack that will have you tapping your feet wherever you go. There are some fantastic sporting facilities here, including golf, diving, hiking, fishing, cycling, horse riding and so much more. Add to that the relaxed atmosphere of the islands and the amazing year round temperatures and you'll never want to leave. The playground of the young, rich and carefree, Cancun is packed full of adventures to be had, whether that's swimming with dolphins during the day or hitting the numerous superclubs by night. With fabulous beachfront hotels in the hotel district offering pool parties with famous DJ's, and quieter more refined hotels just a little further out of central Cancun on the Riviera Maya, you'll find something to suit any taste here. The great thing about Cancun is that it can be all things to all people, so whether you want a taste of the champagne lifestyle on a lemonade budget, to hit the clubs in a tropical setting, an action packed adventure holiday or something more sedate, you'll find it in Mexico’s popular party city. Other great places to try are sophisticated Barbados, beautiful Bermuda, Antigua with its 365 beaches (one for each day of the year), stunning St Lucia, the beach and animal lover's paradise of the Florida Keys, or the amazing Maldives, with each island offering something unique. So what are you waiting for? Dig the suitcases out and start packing the shorts, swimming costumes, maxi dresses from George at ASDA and sandals and head to tropical shores for a holiday to remember. Some gorgeous looking places there. I would love to do these sort of holidays when the children are grown up. Can I say yes please to all? Would just love to travel off to a beautiful beach! They make my heart go whoop too! I can but dream!!! 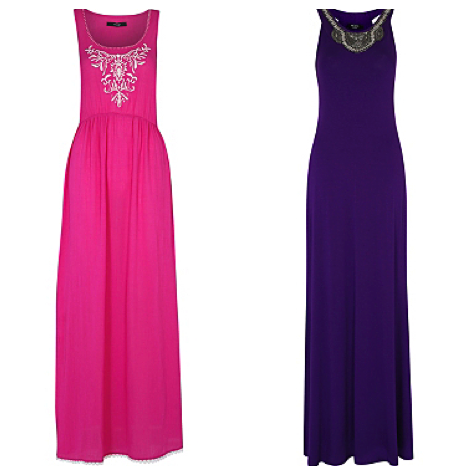 The holiday places look lush, as do the dresses! I love the colour of those maxi dresses. Me too Claire, but I also like to do lots of sightseeing. We had our honeymoon in Mauritius 7 years ago. I really want to go back!!! I'd love to visit any of those places, sadly though with my skin tone I could live there and I would still be pasty white! Yes there are, wish we had the weather though.